The reunion album. The anticipation and reluctance in equal measure. The glory and the failure. Since the mid-2000s we’ve been overrun with once-defunct death metal bands, from every corner of DM’s multi-faceted world, regrouping and re-emerging and of course many have released albums after years of new music silence, sometimes to supreme effect (Cynic, though no longer DM), while others should have kept quiet and stuck with the nostalgia trip of playing older material (Pestilence). And as the world debates the merits of the new Carcass album and looks anxiously towards At The Gates, arguably the most exciting death metal band of the last 20 or so years, Gorguts, have delivered their reunion album, their first slab of new music in 12 years, Colored Sands, a mind numbingly brilliant excursion into the abyss of technical and genuinely progressive death metal. Needless to say, when an album such as this has been brewing for some time, the colossal weight of expectation can easily buckle the knees of the band. However, Gorguts and specifically the leadership of Luc Lemay have always existed inside their own creative sphere, blocked off from the thoughts and intrusions of others. This is, after all, the band that turned death metal on its head with 1998’s Obscura. 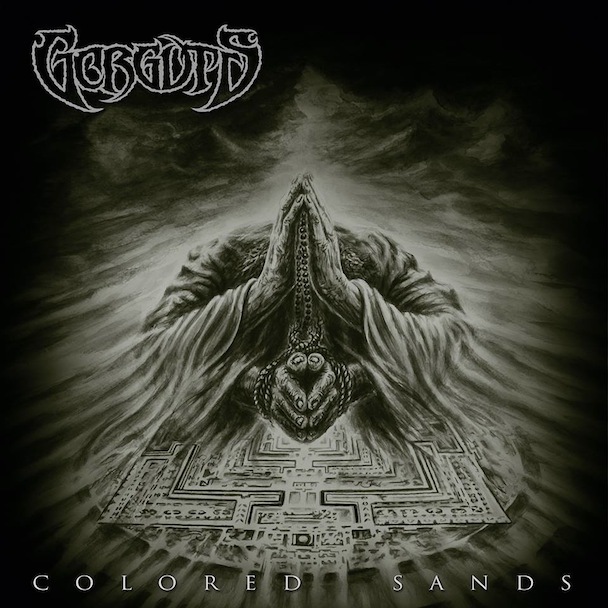 Colored Sands is certainly not an easy to digest album by any stretch of the imagination but has more rounded edges when compared to the angular avant-garde amour of Obscura. That said, opening number ‘Le Toit du Monde’, lays down a thrilling gauntlet with a juddering hail of drums and guitars that quickly gives way to a steam train of corrosive and angular riffing and it’s evident immediately that something remarkable is about to unfold. Second track ‘Oceans of Wisdom’ sees the band peel off a sleeker riff-led outing, where Gorguts’ penchant for chilling and eerie melody shimmers through the cracks of the discordant surface. Similarly, ‘Forgotten Arrows’ weaves sleek riffs at first, disrupted by Lemay’s coarse and earth shattering bellow, exhibiting Gorguts’ wondrous dichotomy in sound to near perfection. The layered sound is of course aided by a gorgeously airy production that gives the band all the necessary room to move and unfurl their mind-bending DM to effect, which is made all so clear by the guitars and vocals playing off and complementing each other so well. ‘Enemies of Compassion’ is a glistening jewel in Colored Sands, which really says something, but the lead riff is quite frankly one of the year’s very best, regardless of genre, striking a balance between memorability and searing cacophony. Meanwhile, the nine minute splendour of penultimate track ‘Absconders’ is an utter joy that strikes another high point for the album, where the band explores some of its slower paced tendencies in trudging rhythms, perfected by shimmery lead guitars that all breaks down into a serene midway passage that gradually builds into familiar intensity once again. This depth and profundity is a common theme in the album from start to finish and Colored Sands is simply rich and dense and fearlessly ambitious. The execution couldn’t really be flawed and Lemay’s newest recruits in Colin Marston, John Longstreth and Kevin Hufnagel have done a sterling job in filling the lofty roles that were ahead of them. The album is easily one of the very best death metal records of 2013 and one of the best progressive records of the year to boot. It’s likely to be the benchmark for which all death metal ‘reunion albums’ are to be measured, and rightfully so; the standard has been raised to a staggering height.